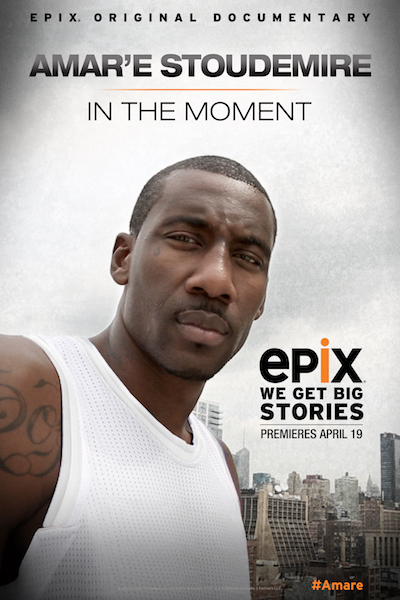 An intimate look at the life and upbringing of basketball great Amar’e Stoudemire in the EPIX Original Documentary Amar’e Stoudemire: In The Moment follows New York Knicks’ power forward and author, whose quest is to bring a championship to New York before he finishes his career. Stoudemire was the first all-star player to sign with the New York Knicks as part of the Knicks’ resurgence; they are now one of the top teams in the league. The documentary is produced by award winning producer Albie Hecht and Worldwide Biggies and joins seven new documentaries premiering in EPIX DOCS, a weekly showcase of documentaries airing Wednesdaysat 8:00 pm ET. Featuring a wide range of subjects from basketball heroes to music idols such as Rick Springfield and LCD Soundsystem frontman James Murphy, the new season of EPIX DOCS includes stories about resolve, obsession, and controversy.